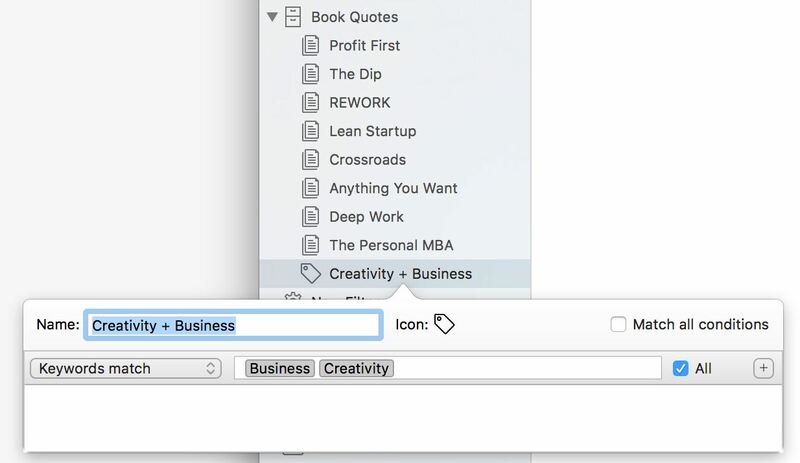 On our sister site, The Focus Course, I recently wrote an article detailing my process for how I build my own, alternate index of notes and ideas when reading a book. You can get much more detail in the link above, but in a nut, an alternate index is no more than something you list out in the back of the book you’re reading that you create and update as you read through the book. It’s a list you create in real time that is comprised of the book’s themes and topics that most resonate with you, as well as the pages that have the best quotes and ideas around those topics. Within that article, I dropped in a brief aside about my desire to begin organizing the notes, highlights, and takeaways from the books I read into a digital database of sorts. As such, I’ve been looking at different research apps to find just the right one. Since I’m already creating an alternate index of ideas in the back of each book I read, what I’d like to do is create a digital and universally-searchable version of that index: a single repository to organize, sort, and search all my highlights and notes. As you can imagine, there are a LOT of notes and research apps out there that do this. The issue wasn’t finding an app that was capable — it was finding an app that works for me and my workflows. I want to do more than simply jot down my ideas and notes. I also want to have them compiled and structured (rather than a giant list sorted only by modification date), but not wholly cut off from one another. And I also want some pretty fancy search capabilities. For instance, I’d love the ability to bring up all the highlights related to “focus” from all books I’ve read. Or, perhaps, to view my notes and highlights related to “time management,” but only from those books that are about entrepreneurship, and then compare those same notes and highlights against books that are only about creativity. That said, here are a few of my initial thoughts on some of the different notes and research apps out there today. Simplenote: This is the app I’ve been using for idea capture and other miscellaneous note taking since it shipped nearly a decade ago. I love how easy it is to use, how — ahem — simple it is, and how reliable the sync is. But for my current use-case, I’m looking for something that can handle images and has a more robust folder structure beyond just tags. Bear: If you haven’t tried out Bear, you really should (Mac / iOS). It’s spectacular (and may even replace Simplenote for me). You can insert photos into notes in Bear, but otherwise it’s still pretty simple. That’s not a knock against the app — it is simple by design. But that means that, for my needs in this case, it’s too simple to be my go-to research app. Day One: This app is one of my all-time favorites, but, as with the aforementioned apps, Day One is not built for what I need in this scenario. Apple’s Notes App: There is a lot to love about the Notes app (and even more once iOS 11 ships). You can drop all sorts of cool things into a note, and even draw and sketch, and more. But the search and sort functionality within Notes is not quite what I’m looking for. Evernote: I love the power of Evernote and its strong emphasis on making idea capture as easy as possible, but I don’t love the way it ruins the formatting of my text and the way all my content is a silo inside the app. There are many, many smart folks who use Evernote, but so far, for me, it still just doesn’t feel right. Together: An alternative to Evernote, Together is a pretty classy app. But, at least so far in my experience, the process of getting information into the app is far too tedious, as is the process for properly tagging that information. I may just need to spend more time learning the app, but if something isn’t easy to use then I know from experience that I won’t use it. 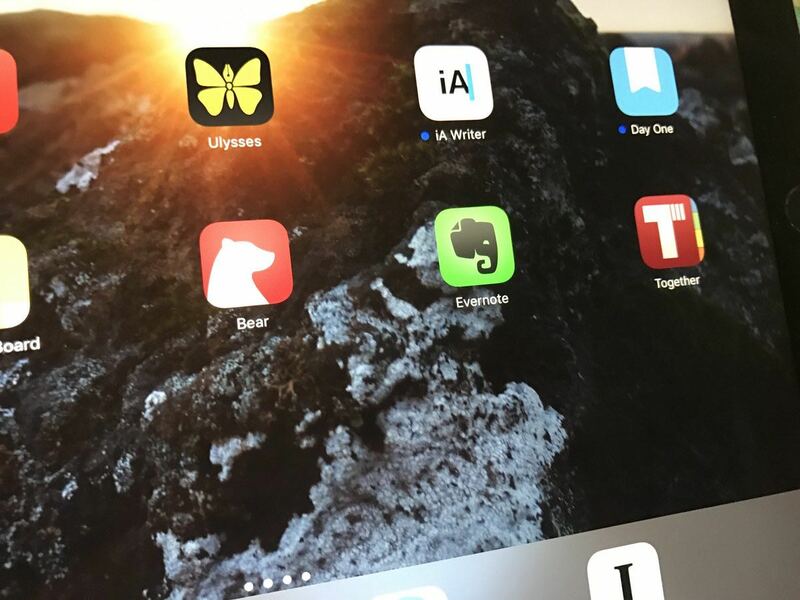 Other Apps: There is also Microsoft OneNote, Scrivener, plain text files with nvALT, DEVONthink, Papers, and probably a few others. Some of these simply don’t appeal to me, and some of them I haven’t yet tried out. I’ve been using Ulysses for quite a long time, but only as a writing app — not for collecting notes and other tidbits related to research. Ulysses is a fantastic app, and it does a great job at simplifying it’s vast complexity. However, I didn’t initially consider it for my researching needs because I didn’t think it had a robust search engine. But, turns out, I was wrong. Thanks to a new project we’re working on here at The Sweet Setup, I just discovered the Smart Filters in Ulysses, and whoa. These filters are basically smart folders. You can create all sorts of variables for how you want sheets to be filtered, and you can even move the filters around within different groups so as to bring up different results based on the group. And here’s a filter I set up that shows me any and all notes I’ve created or worked on within the past 48 hours. The two things that matter most to in my use of notes and research apps are: (1) ease of input and (2) powerful search and categorization. It seems that many apps excel at one or the other, but not both. It’s also critical that these research apps be full-featured on both Mac and iOS. That’s why Ulysses smart filters are so exciting to me. You can get more complex than what I’ve shown above. You can include parameters that search the entire text of a note (not just the keywords/tags), and you can also include “negative” search parameters that exclude notes with certain words. And, these smart filters also sync between Mac and iOS versions. My biggest quibble with Ulysses right now as a note-taking, researching tool is the way it handles inline images. If the image is inline with a note, you see an IMG markdown tag. Or, an image can be attached to a note, but otherwise not shown inline. It’d be great to be able to have images displayed inline. Though, I do like how you can attach images to a note (if you want an image / screenshot nearby as reference material, but perhaps not as something you want to be in-line with your actual text). So, all that said, I’m obviously now using Ulysses (Mac / iOS) as my writing and researching app of choice, and I’ve already begun transcribing all my book notes and highlights into the app. And, as I mentioned, we’ve got something brand new related to Ulysses in the works. Click here to find out more.